SURGICAL TREATMENT AND RECONSTRUCTION FOR CENTRAL GIANT CELL GRANULOMA OF MANDIBLE - case report and literature review. Elitsa G. Deliverska , Hristo D. Stoyanov. Purpose: To present a case of CGCG of the lower jaw in Department of Oral and maxillofacial surgery, University Hospital "St. Anna". Although en bloc resection provides the lowest recurrence rate, only a few single case reports describe the use of this technique followed by reconstruction with autogenous bone grafts. Material and methods: The medical history of a 28 years patient with a large central giant cell granuloma in the mandible. Biopsy specimen taken from the lesion showed CGCG followed by curettage with peripheral ostectomy with preservation of the continuity of the mandible. Result: At the 1-year clinical and radiological follow up there was no sign of recurrence. Conclusion: After complete healing of the graft, prosthetic rehabilitation with implants will be perfomed. This allows the best functional and aesthetic results. Deliverska EG, Stoyanov HD. Surgical treatment and reconstruction for central giant cell granuloma of mandible - case report and literature review. J of IMAB. 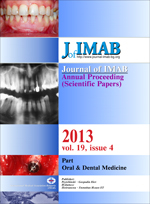 2013; 19(4):407-410. doi: 10.5272/jimab.2013194.407. 10. Whitaker SB, Waldron CA. Central giant cell lesions of the jaws. A clinical, radiologic, and histopathologic study. Oral Surg Oral Med Oral Pathol. 1993 Feb;75(2):199-208. [PubMed].